happy hour in the desert – RV Cheaper! April 26, 2013 December 29, 2014 RV Cheaper! 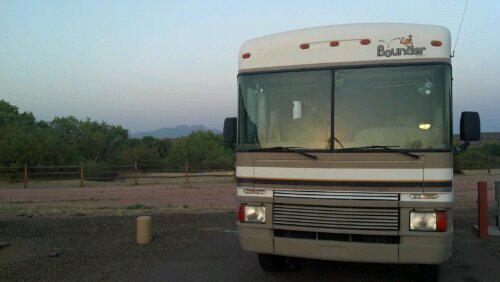 We arrived just before sunset, had to catch this shot with the Four Peaks in the background before I bothered hooking up. My brother Mike and his wife Michelle took delivery on their Monaco Diplomat this week (http://anddrinkplentyofit.wordpress.com/). After the usual detours of taking delivery on an RV (and getting out of Dodge) they made it to the Eagle View campground near our home (http://www.eagleviewrvresort.com/). Alice & I were thinking about when we could get over to see them and realized it’s Friday night, why not have Happy Hour at their place? We promptly called them up and once we found they didn’t have anything planned, we invited ourselves over to thier place! Mike talked to the host before closing and got us lined up with the campsite next to theirs. These sites are awesome, they back up to the Verde River and over look the Four Peaks and other mountain ranges. We had a few drinks and watched a full moon rise over the mountains. We didn’t get around to playing cards until about 10:00pm and kept them up until past midnight. What a great way to wrap up the week! Yes and it was great having the time to spend together, and hopefully many more to come!